Fancy Tiger Crafts: Springtime Same-sies! Samesies! 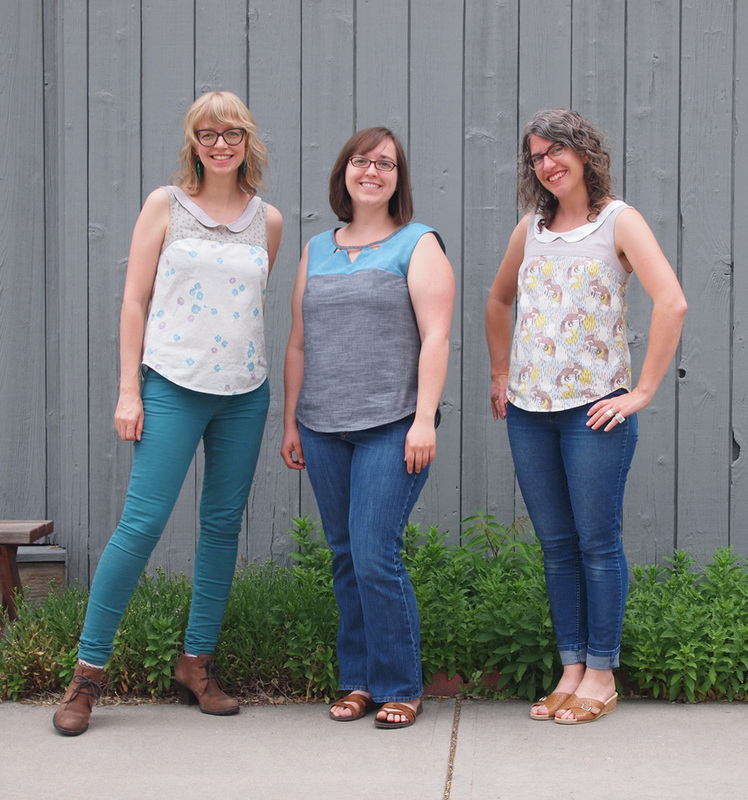 Amber, Caitlin and I recently finished some new shirts - the Datura Blouse from adorbz French pattern maker, Deer and Doe. This little tank is cleverly put together and we promise you will want to have a few on hand for all your summertime outdoor-type get-togethers. I broke the ice and tested the pattern with these awesome fabrics. I've had a couple of yards cut of this Sarah Watts fox print from her Timber and Leaf collection for a bit. I thought it might be too much to have it all over, so I paired it with a soft Kaffe Fassett shot cotton on top and some Kona Snow for a collar. The results are a fun top with subtle-fox-action. The back of the shirt features a nice button detail so bright yellow buttons were a fun way to finish this top. The fit is great and it is comfortable to wear. The Deer and Doe patterns are now translated into English so there were no problems in sewing this up. Amber was so excited about this top she went ahead and made two at once! The first one is a soft and beautiful Japanese tank with Nani Iro on the bottom and a Lecien lawn on top. A shot cotton makes for a pretty collar. Cute! Look at those awesome bright purple buttons! Want! 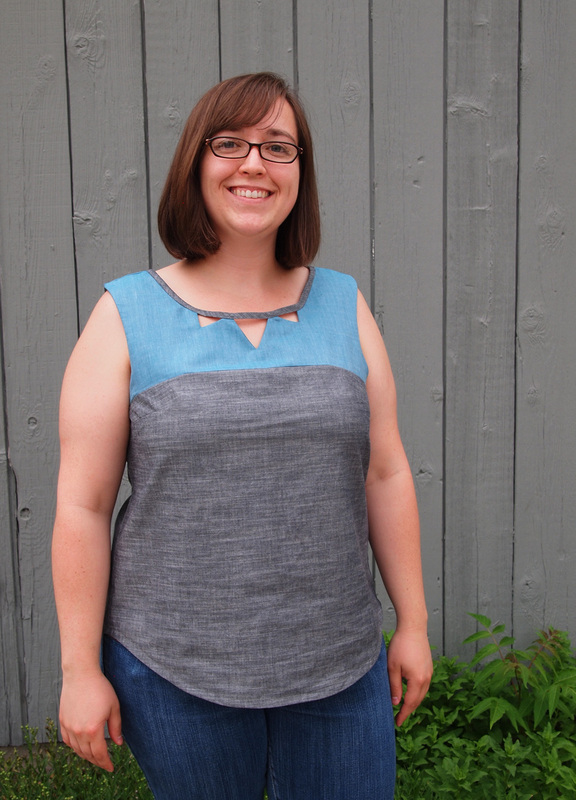 Did you know the Datura blouse has two collar options? Yep. Caitlin choose to make hers with the cut-out collar. 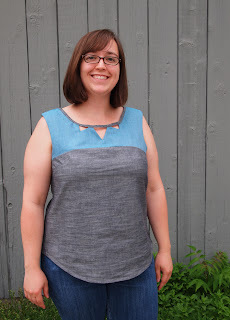 The top of the blouse is fully lined and the top is finished with bias tape. The bottom of Caitlin's Datura blouse is made from one of our delicate and drape-y yarn-dyed voile fabrics. The top of her blouse is from a fabric she had from her great-grandmother. She inherited this fabric as sleeves that her great-grandmother had cut out but never sewn. 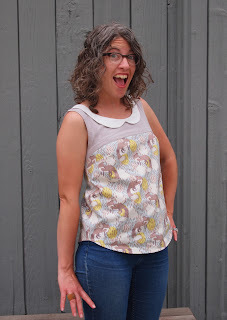 The sleeves ended up being enough to make this the perfect top. What a lovely way to honor her, Caitlin! I love it. 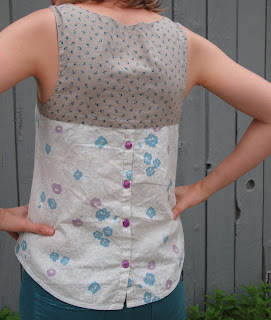 Caitlin finished her special blouse with some wooden printed buttons. Amber's second Datura is a brighter tank. The bottom is from Lizzy House's Constellations collection, the top is an Alexander Henry floral and the bright blue collar is the perfect touch. You too, can be a twinsie with us. We have lots of Datura Blouse patterns in stock so don't delay! You'll want to make a bunch of these this summer and we want to see them all! Can you buy this pattern online? Can you give a little review? Was this a relatively easy pattern? I want to make three! Four! We don't sell online, but email us at fancytiger@gmail.com and we'd be happy to ship. I would rate the pattern as beginner plus. The fact that the top is lined makes it easier - there isn't any bias finishing at all. If your machine can do buttonholes, that will help out a lot as well! Please offer a class for this! I love it, but don't know how to do it on my own. Your tops are all so cute, you all have such different body types, what type of fitting modifications I'd you do? I just made a Datura and saw the photos of yours. They are great! I have put a link to them in my new sewing blog at carolineparadigmdesign.blogspot.com.